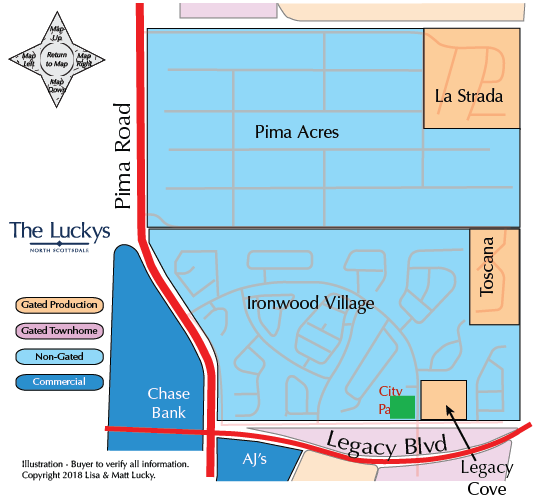 The Ironwood Village Area map includes Pima Acres, Ironwood Village, and gated subdivisions of La Strada, Toscana, and Legacy Cove. These subdivisions are conveniently located only one mile off of the 101 freeway, off Pima Road in north Scottsdale. This location is considered one of the best in all of North Scottsdale. Minutes away from the finest shopping, dining and leisure activities in the foothills of the McDowell mountains. Walk to the 4 acre City of Scottsdale park with playground, picnic area, ramada, lighted basketball court and lighted tennis court. Numerous bike paths and walking paths take you from one neighborhood to another. See all Ironwood Village Area New. See all Ironwood Village Area Sold.